Pinch & Dash feat. 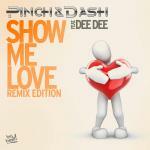 Dee Dee - Show Me Love (Tribune Remix) lyrics • Hands Up! HKO, you know better than this right? Since it's written by the artists themselves, copy/pasting it is acceptable.